Cattleyas are what most people think of when they hear the word orchid. Producing large and fragrant flowers with vibrant colors that are commonly used in corsages, Cattleyas are a popular choice for beginners and experts alike. These plants are very sturdy and can take a lot of abuse from those who tend to forget to water. They are also tolerant of several temperature ranges. Miniature Cattleyas are also available, which are great for those with limited space. Cattleyas need abundant though not intense light in order to grow and flower well. About 2,000 - 3,000 foot-candles is satisfactory, and as with many orchids, the early morning sun is very important. An east window, or a south window with light shading such as a sheer curtain from the middle of February to the end of October is ideal. L.E.D. Grow Lights are the best artificial light you can provide for Cattleyas. Be sure to check out our L.E.D. Grow Lights page for more information. Cattleyas thrive with a day temperature range between 70 and 80 degrees F. At night there should be at least a 10-degree drop, around 60-64 degrees F. This lower night temperature will help initiate flower buds and will promote stronger growth. Keeping the plants near a window is important if you do not provide artificial light. Cattleyas can be grown outside from June to late fall in areas with filtered light. Direct sun will burn the leaves. If you live in an area where snow falls (like here in Minnesota), you can leave Cattleyas outside until the first frost. Cattleyas like a humidity of between 45% and 60%. This may be attained by the use of a humidifier, or by filling a saucer with crushed rock and placing it under the plants. Then, when you water, the run off will fill the saucer, releasing humidity into the air via the crushed rock. However, make sure that the pot is elevated above the water level in the saucer. Always use a clean form of water such as distilled, rainwater or reverse osmosis water for your plants. Cattleyas should be watered when the potting medium feels dry almost to the bottom of the pot. This generally occurs every week or so from the previous watering. If in doubt, don't water. Wait another day or two. Remember that small plants in clay pots can dry out within a couple of days. Plants should never stand in water. Cattleyas generally bloom large and fragrant flowers. 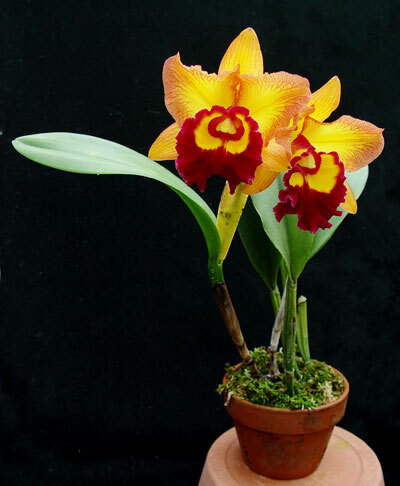 The average flowering period for a Cattleya is 3 to 6 weeks. Make sure to water more often when Cattleyas are about to bloom, and throughout the blooming period. The flowers will drop when the blooming period is over. In the summer, Cattleyas potted in fir bark should be fed every second watering with a half strength solution of Grow More 20-10-20 fertilizer. In the winter feeding once every three or four weeks is sufficient. We highly recommend Green Jungle Orchid Food, especially formulated to work with rain, distilled, reverse osmosis water or water low in alkalinity. Fertilize with Green Jungle every time you water. Medium grade fir bark is one of the best potting mediums that can be used for Cattleyas. In general, repotting should be done every 2 years in the spring. Repotting becomes necessary when the plant has outgrown its pot and the new growth reaches out over the edge, or when the potting medium has broken down. When repotting, chose a pot that is large enough to accommodate 2 or 3 years growth (1 or 2 new pseudobulbs per year). Grab the plant near the base of the pot and start by gently, but firmly, pulling the plant out of its old pot. When growing in clay pots, it is sometimes easiest to simply take a hammer and break the clay pot, clearing away the clay shards. Do not worry about breaking or cracking roots, because you will break several in the process. This does not harm the plant. Pry out from between the roots as much of the potting material as you can. Trim off any dead roots and/or dead pseudobulbs and position the plant with its oldest pseudobulbs to the edge of the new pot. Then, spreading the plant roots out, fill in the space with the potting medium. Press down firmly with each handful so that the plant does not wobble around. Build up the compost until the plant rests with its rhizome on the surface, about a half-inch below the rim of the pot. Newly potted plants do have a tendency to wobble, in this case you can use a ring support or rhizome clip to secure the plant. To divide a plant simply pull it out of the pot and cut through the rhizome between the pseudobulbs leaving three to four bulbs per division. If possible try to untangle some of the roots for each division. You may have to cut some of the roots in order to divide the plant, but this is inevitable. Keep dry for the first week after repotting.